Interior and Product Design students relish trip to Europe! Project success for Fashion and Textiles students with local designer Paul Burbridge! School get involved with the City’s Big Ceramics! Interior Design graduate relishing new career. Applied Arts student earns residency at FabLab! Visual Communication student earns a trip to Hollywood! Second Year BA (Hons) Fashion & Textiles Students Tutored and Inspired by Designer Jenny Postle! Fine Art students and alumni take part in Tony Oursler's The Influence Machine. BA (Hons) Visual Communication (Illustration) graduate Sarah Graley is going from strength to strength in her illustration career. 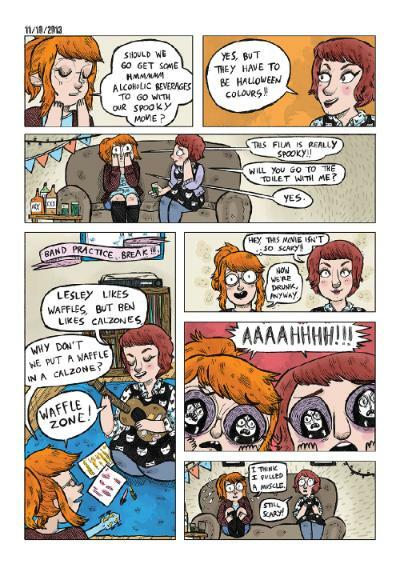 Things really started to take off for her late last year when she ran a Kickstarter campaign to fund a hardcover book collecting 200 strips from my diary comic Our Super Adventure. It received over 400% funding and ended at £21,601! Soon after she was recruited on to literary agent’s Curtis Brown LTDs books and she’s now working on a graphic novel that she’ll soon be pitching to American publishers! We caught up with her and she told us: “I was also nominated for the Emerging talent category for the British Comic Awards 2015 for my self-published titles, RentQuest, PizzaWitch and Our Super Adventure. I didn't win, but I got a sweet mug and it's an honor to have made the short list. “Yesterday 'Lil' Poopy Superstar' was announced, which is a spin off comic from Cartoon Network/Adult Swim's property Rick and Morty. I am both the writer and artist, and the comic is getting published through Oni Press! More details about studying Illustration.